Two of Jennings Gym’s rising stars will go for national titles this weekend. Ryan Hughes and Haaris Brown head to Sheffield this weekend for the final stages of the National Junior Championships. The duo, trained by Chorley’s former world title challenger Michael Jennings and his brother Dave in Coppull, won through the quarter-finals at Barton ABC in Eccles, Greater Manchester, last Saturday. England boxer Brown will look to win the big one this time after being a losing finalist in the Schoolboy category last year while for Southlands High School pupil Hughes it will be his first taste of the business end of a major competition. The semi-finals take place on Saturday with the finals on Sunday. “We’re hoping Haaris can go one better,” said trainer Dave Jennings. “For Ryan things have really come together. “He’s really put the time in and his hard work is paying off. Two of the Jennings’ fighters did however lose out in the last eight. Archie Smith was on the wrong end of a controversial decision while Cian Masterson’s defeat was more clear cut, the youngster putting up a fine effort in just his fourth amateur fight. “For Cian to get as far as he did was a real achievement,” said Dave Jennings. “He was in against lads who had been in 20-plus fights. “Archie’s was tough to take but that’s what you get in amateur boxing. On the professional front, the Jennings’ unbeaten middleweight Mark Jeffers hopes to return to action in May. The Eccleston prospect, 9-0 in the paid ranks, was due to return to action on March 9 in Bolton only to pick up an ear injury. Elsewhere in the gym, Kirkham super-lightweight Adam Little has been ticking over after suffering minor hand problems in his victorious return on March 2 after 18 months out of the ring due to complications with his medical. 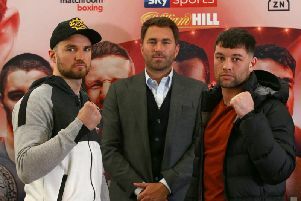 It is hoped the former English champion, 19-2, will find himself back in a significant fight before the summer is out.